New levels in ergonomics, materials and above all safety are all found in this new seat. Working closely with the FIA foundation to identify ways to improve safety, the Pro-ADV is a result of this collaboration. Increased rigidity and the use of impact absorbing materials are the major advances found in the Pro-ADV seat. Features: FIA Approved. Bottom Mount Head restraint "Halo" Fiberglass shell. Hans compatible. Racing seats are shipped free from the UPR Arizona warehouse only. Free shipping does not apply to orders that are drop shipped from the manufacturer. How much fun is it to win the big race but you can barely climb the podium because your seat pummeled you every inch of the race. If you had the UPR Racing Seat Pad under you, you'd really be celebrating! 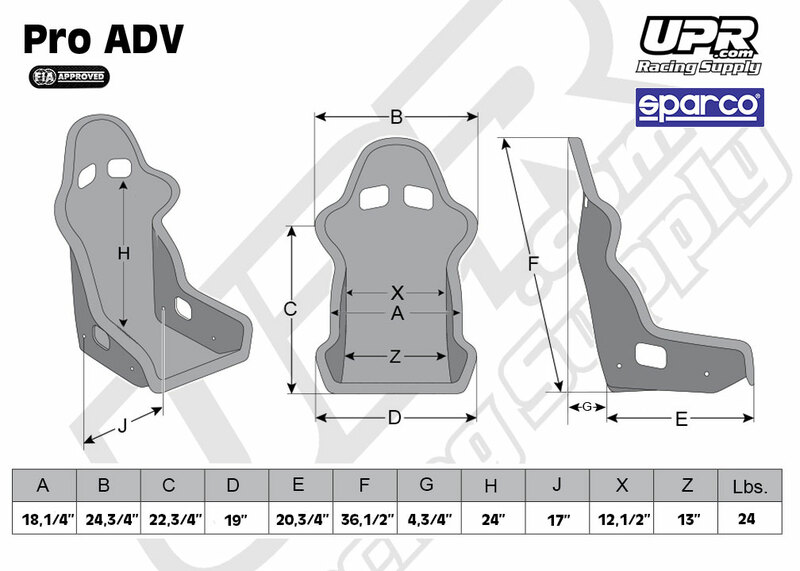 What's so special about the UPR Racing Seat Pad? For starters, it's been in the winners circle of every major off road racing event for the past decade. The UPR Racing Seat Pad is just as important as any other piece of performance or safety equipment on your race vehicle. Especially recommended for off road racing vehicles, but also works well in road race and street cars. The full bottom pad will fit most shell style racing seats as a replacement for the standard foam bottom. Constructed of approved fire resistant, multi-density foam material that is soft to the touch but increases in firmness as it's compressed. The UPR Racing Seat Pad can be used in most composite and aluminum shell style racing seats. From the safety standpoint, it adds another layer of impact absorbtion for you. You probably have experienced first hand those bone jarring bumps that made you wish you has a little more suspension. The UPR Seat cushion could very well be that little more suspension. The countoured design of the UPR Racing Seat Pad also supports your body in a more ergonomic position. This helps to lessen fatique and increase comfort, which is very important on long races.